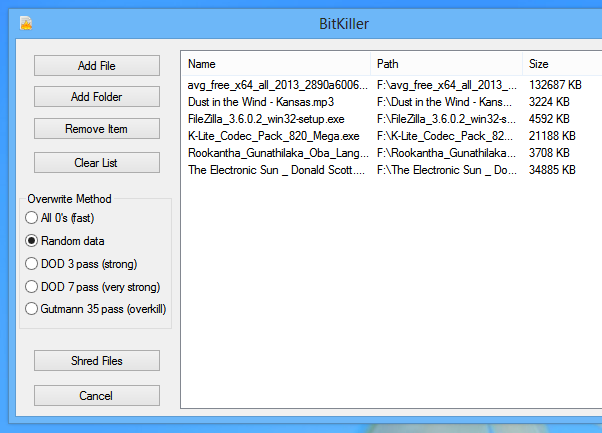 ‘BitKiller’ is an application that lets you easily delete files & folders securely (beyond the ability to recovery them later). It is open-source (GPL licensed), free to use and doesn’t need to be installed either, so you can use it as a portable application as well. It can only be used with files or folders, and cannot be used for wiping partitions. The best way to add multiple files (scattered in various locations) is to simply drag-n-drop them into BitKiller’s window because the ‘Add file’ dialog box only lets you add one file a time. You can also use the ‘Add folder’ option if they are located in the same location. ‘BitKiller’ comes with few secure file deleting methods: ‘All 0’s (fast)’, ‘Random data’, ‘DOD 3 pass (strong)’, ‘DOD 7 pass (very strong)’ and ‘Gutmann 35 pass (overkill)’. The first and the second methods are the fastest as they fill the sectors with zero’s (first method) or random data, and only do it once. Other methods use different file ‘filling’ methods and fill them more than once thus take longer times. I have tested the ‘Random data’ (default) and ‘DOD 7 pass …’ methods. After deleting some files using those two techniques, I tried to recover the data using ‘Recuva’ (a popular file recovery application), in its ‘Deep scan mode’. But it was not able to recover any data. If you are in a hurry, then you can use the ‘Random data’ method as it is faster. Or if the data are pretty sensitive (if you have a lot of small text files for instance) then you can use one of the other methods for additional security. But as I’ve mentioned in the past, there are complications that can affect deleting files securely, negatively. For example, say that a particular file that you deleted was copied from a different location (say in the same partition). Then while a file recovery tool scans, there is a chances, that it being able to recover that file’s data from its previous location. In those situations, you should also securely wipe out the ‘free space’ where that file (s) was previously stored. For that, you can use a tool like ‘BlankAndSecure’. So in that sense, it would be useful if ‘BitKiller’ had an option for deleting the free space as well. Also, while deleting files it displays a simple progress-bar window. However, if you tried to drag it to somewhere, then in Windows 8, it gets labelled as ‘Net Responding’, though ‘BitKiller’ is running from the background and finishes the deletion successfully.